A major trial dating back to the dark years of Spain’s economic crisis kicks off Monday over the alleged fraudulent 2011 listing of financial giant Bankia, with ex-head of the International Monetary Fund (IMF) and Spain’s former deputy prime minister, Rodrigo Rato, in the dock. The Spanish state was forced to step in to prevent the bank’s collapse and then to borrow 41 billion euros from the EU to keep Spain’s banking sector afloat. The trial is expected to last at least seven months, until the end of June. The image of a smiling Rato ringing the bell and sipping champagne on 20 July 2011 to mark the start of Bankia’s listing has since become a symbol of the scandal. More than 300,000 small shareholders had bought share packages for a minimum of 1,000 euros, attracted by a major advertising campaign and the profits boasted by the bank. But in 2012, after a disastrous year that saw its share value drop, the bank admitted that the year it listed it had actually made a loss of close to three billion euros. 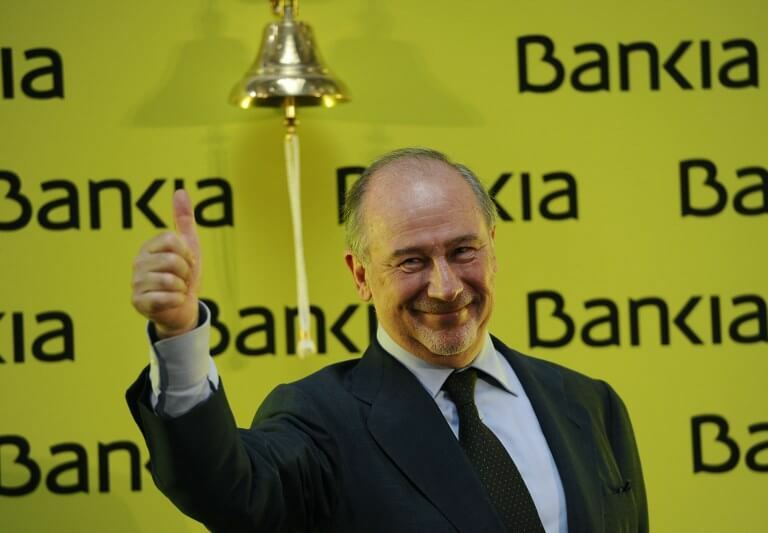 Bankia’s former chairman Rodrigo Rato gives the thumb up after launching the trading of Bankia at Madrid’s stock exchange in July 2011. That forced the state to nationalise the bank to save it from bankruptcy by injecting more than 22 billion euros into Bankia. That in turn prompted an EU rescue plan for Spain’s banking sector. The results presented to investors had been ‘completely false’, investigating magistrate Fernando Andreu wrote in a court document. He said the moment when the bank recognised it was in difficulty brought to an end ‘the dreams and delusions of grandeur of the entity’, born in 2010 through the fusion of struggling savings banks. ‘For us, that doesn’t settle the incredibly serious fraud that was committed,’ said Fernando Herrero, secretary general of the Adicae association of bank users, a plaintiff at the trial. The state, which still owns 61% of Bankia and should in theory privatise the bank again, has recognised several times that it won’t be able to recover much of the money it disbursed. ‘The listing of Bankia was a kamikaze operation,’ said Ernesto Ekaizer, a journalist who wrote a book on the affair. They were accused of misusing 12m euros between 2003 and 2012, spending on fuel for their cars, supermarket shopping, pricey holidays, luxury bags, and parties in nightclubs. Rato was sentenced to four and a half years in jail for embezzlement. The former economy minister is also accused of tax fraud in a separate case.